It’s been a LONG week here, but this weekend should prove fun with a birthday party. 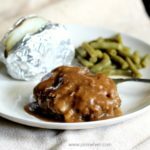 Before I got too busy I wanted to share this Slow Cooker Salisbury Steak recipe. It’s one of my favorite slow cooker recipes. I thought if I shared it before the weekend, it would give you a chance to add it to your grocery list. And trust me, you are going to want to add this to your grocery list! What Ingredients Are Needed to Make A Slow Cooker Salisbury Steak? The best part about the yummy salisbury steak recipe is that it is made in the crock pot. Just a few minutes to prep and then dinner is ready when you get home. To make this delicious meal you are going to need to gather just a few ingredients. While it does take about 20 minutes to prepare before placing into the slow cooker, it is time well spent, and very well worth it. Let’s get started! Heat the oil in a large skillet over medium-high heat. Cover the steak patties in flour just to coat, and then place them into the heated skillet to quickly brown on both sides. Place browned patties into the slow cooker stacking alternately. They will stack on top of each other, so place them as evenly as possible. In a medium sized bowl, mix together the cream of chicken soup, au jus mix, and water and then pour evenly over the patties. Cook on the Low setting for 4 or 5 hours, or High setting for 2-3 hours until ground beef is well done. Serve with mashed potatoes, salad, and rolls. This is such a delicious recipe, and one you won’t mind having often! I truly love how the gravy mixture turns out, it is AWESOME. We are a fun loving Southern family, and this is one of those Southern recipes that will never go out of style. YUM. 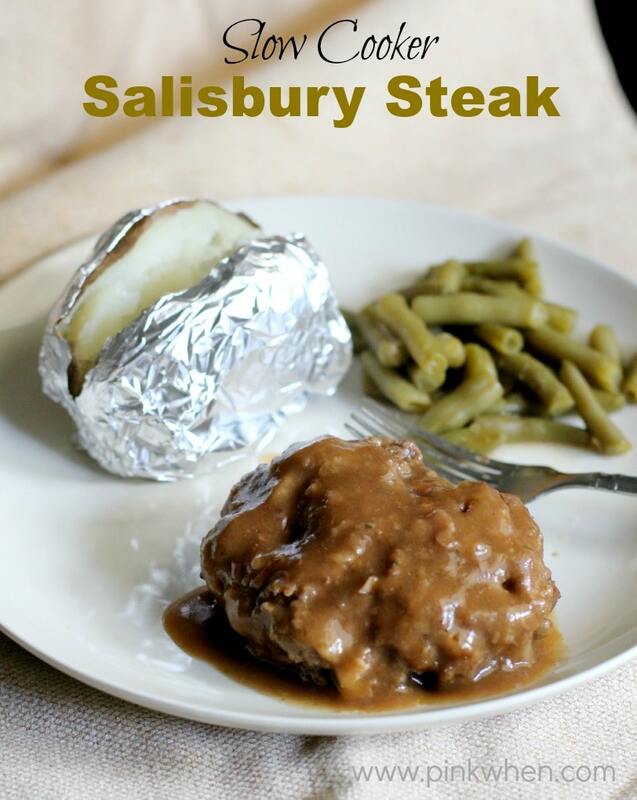 Make sure you print out the Slow Cooker Salisbury Steak Recipe and make it this weekend! 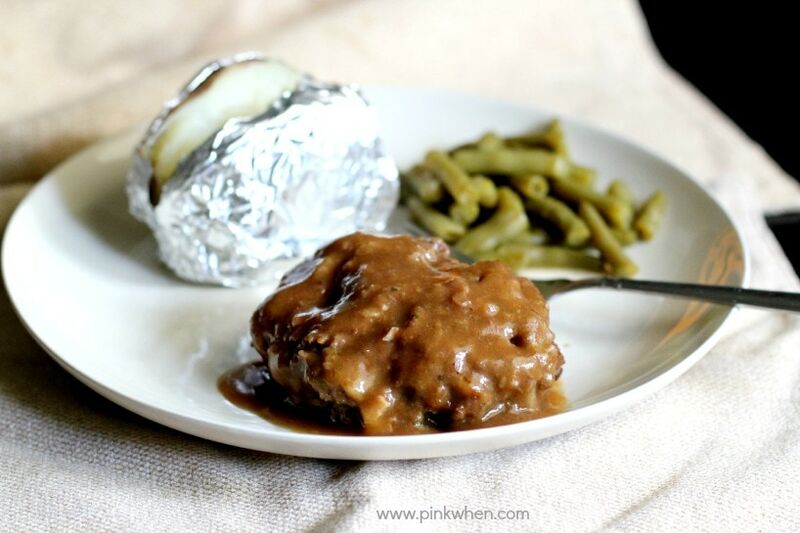 A delicious Southern-style Slow Cooker Salisbury Steak recipe. Only a little prep for a ton of flavor. If you liked this Slow Cooker Salisbury Steak Recipe, you are sure to like this list of 30 Slow Cooker Chicken Recipes, or this list of the 25 BEST Slow Cooker Soup Recipes. yum! There is still tomorrow because Cassidy did the food shopping today and forgot two of the most important things. So this can be a go! You are right…I do want to make this! My oldest son loves Salisbury steak and I have yet to find something he likes as much as what I got from a local grocery store’s deli years ago that closed down. I’m pinning your recipe to try! This looks wonderful, going to try it this week 🙂 I was wondering, have you ever tried this as a freezer recipe? I was thinking to make the patties and sauce separately, then freezing until cooking day. Would love any ideas! That would be a great idea! I haven’t done too much freezer cooking, but would love to be a little more organized and start! I’m not sure you would have to freeze them separately, I would probably try and keep them together. This was so good! My family was skeptical about it when I told them I was making it. Some are picky eaters. But they LOVED IT! I thought it was excellent as well. This is delicious !! The whole family loves it! !